Generic Company Place Holder Heavy Mach. Back in high school on the weekends, I could often be found playing side-scrolling action games that were fun and didn’t need to be taken too seriously. 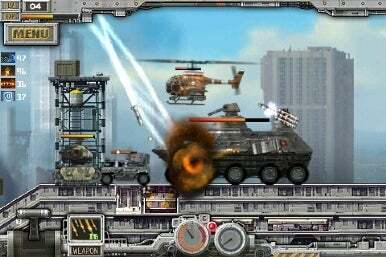 This idea has returned with HeavyMach, a side-scrolling tank game by developer IndieAn in which your tank must wipe out opposing forces to reach the next level. Grab power-ups, additional armor and weapons such as missiles, lasers and bombing runs to even the odds and you’re good to go. Jump and blast your way through enemy fortifications in HeavyMach. HeavyMach provides a jump ability and leveling up. Incoming missiles and bullets can be nimbly jumped over via your tank’s propulsion system while experience points can go towards leveling your tank up. Once a new level has been reached, you can upgrade your maneuverability, defense or attack powers as needed. There isn’t much of a plot or even an attempt to create much of a story, but the classic arcade feel of the title is there and strongly presented with bright, crisp graphics and some of the best sound I’ve ever heard from my iPhone. Beyond the arcade elements, there’s a nice attention to detail that makes the game fun to play. Well-designed touch controls allow you to feel as if your movements are natural and realistic without having to over or under-compensate. A nice incorporation of strategic elements adds to the title and players can roll in and out of an opposing tank’s range, jump over incoming fire or use buildings and overhangs as cover to avoid an incoming missile barrage. A selection of game modes keeps things interesting and you can choose between the classic level-based Scenario mode or take out waves of enemies in Survival mode. A reliable passive save system rounds things out and players can pick up from the level they left off. There are some kinks to work out, such as crashes in which the application froze, made stuttering noises and returned to the iPhone’s home screen. While this only happened twice, it’s enough to pay attention to and hopefully a bug fix will resolve the issue. This aside, HeavyMach is a great side-scroller for both the action fan and the user longing for the arcade days. With a little polish, the title could be that much better. HeavyMach requires iPhone OS 2.1 or later to install and run.